Well as I mentioned in my last post, I thought it was about time for a face to face. 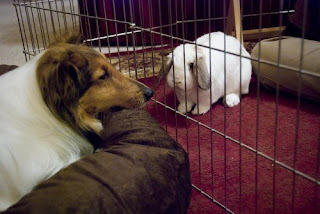 Herbie had calmed down about the ferocious smell of Millie, and we thought he would be ready to meet her face to face. We decided to start in the living room. 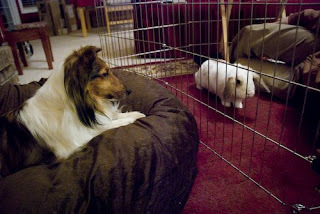 Millie would be in a sit/stay on her bed with me and Herbie would be in his pen with Joe and lots of treats to distract. We were very pleased with the results. There was no thumping, no whining, and a good amount of curiosity between the bars. Millie stayed very nicely, curious about what was going on, but not fixated. Herbie enjoyed the treats, took some time to smell and look through the bars, but eventually got tired of being trapped in his pen (about 15 minutes in). The session was going so well that we decided to do a more traditional bunny bonding session. Both pets would be in the enclosure with supervision. This went well also, a little bit of curiosity on the part of both Millie and Herbie, but after a while, casual indifference. 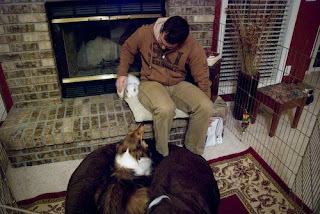 I pet both simultaneously, mixing scents. Before long, both were lounged out in complete satisfaction. Over the last few days, we have had a few more of these sessions. We've also allowed both Herbie and Millie to be out in the living room together as long as we are keeping close supervision. The last few days of interactions in the living room have been a few curious sniffs here and there. Right now, both are getting more accustomed to the others movements and behaviors. When Herbie is out romping, I have Millie lay on her bed. 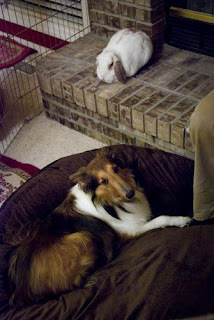 When Millie wants to romp a bit, I make sure that Herbie is in a safe location in his favorite lounging spot. While our bun and dog are not what I would call best friends at this point, after only a week, they are tolerable of each other. Stay tuned for more to come! hello! my boyfriend and i have two pet rabbits that also have run of the house; we are planning on getting a dog sometime this week.. the advice on this blog is very helpful! we too are very concerned about the introduction. thanks, i hope you keep posting!